‘Eurocode 2’ and ‘EC2’ are both abbreviations for BS EN 1992, Eurocode 2: Design of concrete structures. When referring to Eurocode 2, most people mean BS EN 1992-1-1 General rules and rules for buildings. What are the guiding principles of design to Eurocode 2? Eurocode 2 deals with phenomena e.g. flexure (with or without axial force), shear, crack control, deflection control etc. rather than types of element e.g. beams, slabs, columns, etc. Eurocode 2 does not contain derived formulae. For example only the details of the stress block is given, not the flexural design formulae. Users are expected to derive their own formulae or use published guidance - such as that provided by The Concrete Centre. o the design of precast, lightweight and plain concrete. o the design of bridges and water retaining structures in Parts 2 and 3 (whose clauses work by exception to Part -1-1). Durability requirements are explicit: cmin + Δc,dev, where cmin depends on environmental conditions (and bar bond) and Δc,dev is allowance made in design for deviation (in placement). Notional horizontal loads are considered in addition to lateral loads. Overall, the design process still means verifying that the proposed elements and structure comply with the requirements for the ultimate and serviceability limit states. Eurocode 2 refers to a number of other European Standards, for basis of design, actions, geotechnical and seismic design, ‘execution’, material properties and specialist applications. In the UK, the complementary BS 8500 is used for the specification of concrete and in the absence of EN 10080, BS 4449 is used for steel reinforcement. 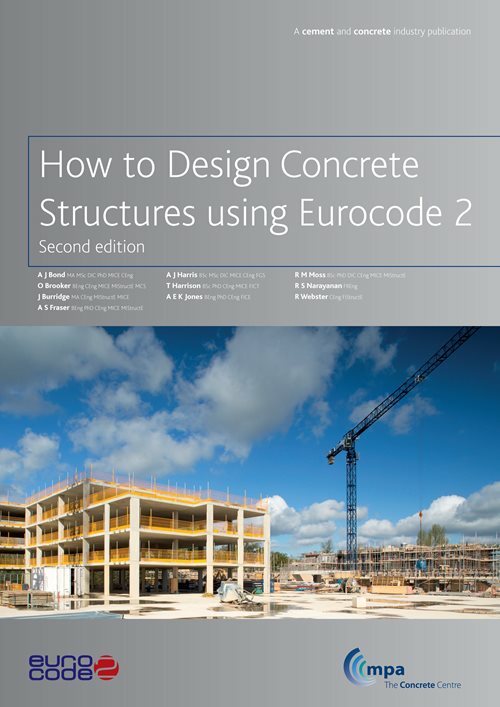 Although Eurocode 2 replaced all previous national codes dealing with the design of structural concrete, there continues to be a period of transition. Previous British Standards such as BS 8110, BS 8007 continue to be used but were ‘withdrawn’ in 2010, i.e. they are no longer supported by the relevant British Standards Institute committee. They will become decreasingly relevant and their use fall away. In the long term, it is anticipated that EC2 will result in more coherent and economic structures so conceptual design done to, say, BS 8110 may confidently be taken through to detail design using EC2. In common with other Eurocodes, Eurocode 2 is due for a published revision in 2020. See Background to Eurocode 2. The Concrete Centre has a wide range of resources available to assist engineers with designing to Eurocodes. Explore the Publications Library and use the search category 'Codes & Standards'.